Oi! Over 'ear. Hackney Podcast's sonic wizards launch Hackney Hear app. Those sonic wizards at Hackney Podcast have done it. You can now download their Hackney Hear app onto your phone and become immersed in the layers of historic and contemporary culture conjured up at your GPS-linked location in Hackney. Music, stories, poetry... it's all there. It's devilishly clever, brilliantly entertaining and, as always, a sonic delight. About Hackney Hear from Hackney Hear on Vimeo. All over the country local people are organising to protect their open and green spaces, their architectural and cultural heritage and the rights of all to participate in, and benefit from, decisions which affect their local communities. They are fighting not just for themselves but for future generations to live in a diverse natural and built environment. It is a 'battle against the bland' - against top down corporate solutions which leave behind monocultural non-places where local character and identity have been damaged or lost. On the side bar you will find links to some of the communities' struggles which we have followed - the tenacious Wards Corner Coalition and Friends of Queens Market have both had notable victories. 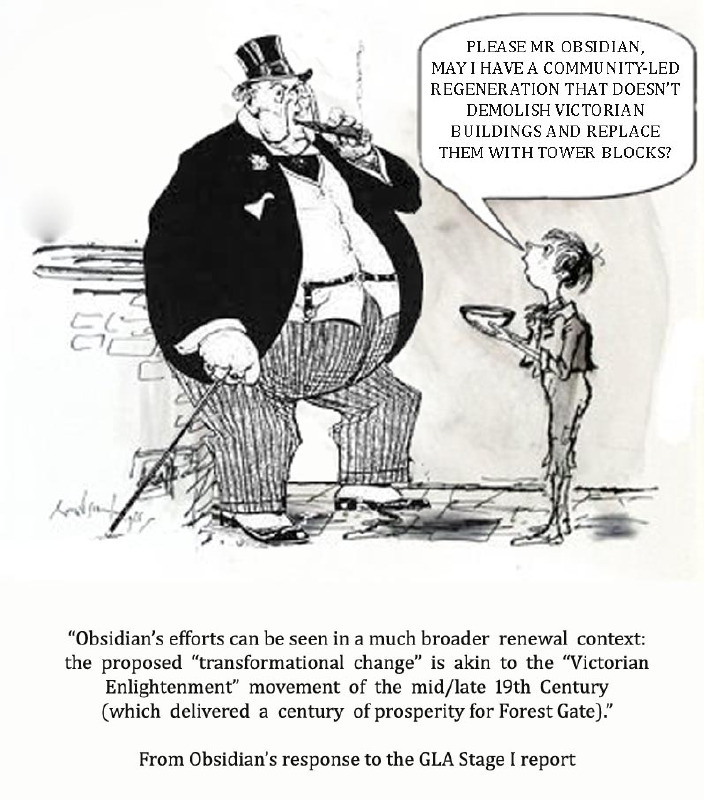 Save Forest Gate campaigners have just recently had success by persuading Boris's Greater London Authority, in its Stage 1 review, to reject the Obsidian/Newham Council scheme. It would have demolished a huge area of the old town centre, including Victorian villas and a Methodist Church Hall, which would have been replaced by massive and inappropriate development including a 'landmark' towerblock by the railway station. SFG is now demanding community participation in developing any revised scheme. The campaigners of Keep Willesden Green are fighting to keep their open space, their Victorian landmark building, their library and bookshop. They have commented on this blog that they have been encouraged by OPEN Dalston's recent success. We wish them all power and success in their battle. Private developer would get a windfall benefit. 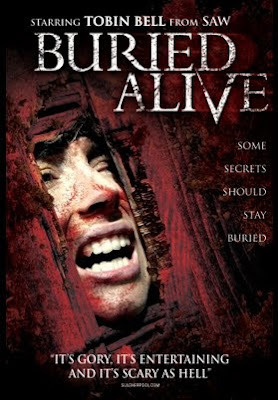 Public body would get nothing. 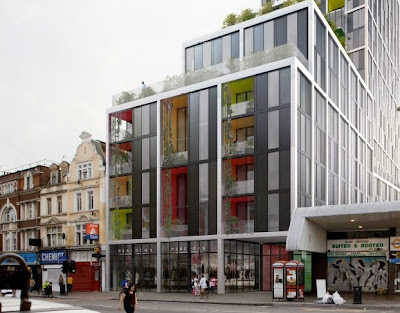 Last Thursday, following Wednesday night's Planning Committee meeting which rejected the Dalston Kingsland towerblock scheme, the Hackney Gazette published this article. You may find the article easier to read here. Had the planning permission been granted the developer could have proceeded, as planned, to build towers with windows in the north boundary walls overlooking the railway land. Network Rail stated that it has no plans presently to develop the station and was not going to oppose the planning application. However a later planning application by Network Rail to develop the station would be likely to be refused if it would result in the windows of the new towers being obscured. The developer had maintained that an 18 storey tower was essential to the financial viability of the scheme which included paying £1.7 million for the Dalston Kingsland station upgrade instead of providing affordable housing. OPEN Dalston queried what Network Rail would get back from the developer in exchange for giving up its development rights and why the developer, and not Network Rail, was paying for the station upgrade. The developer's solicitors wrote to OPEN in very forceful terms stating that no agreements had been, or were intended in the future to be, discussed with Network Rail and Transport for London. You will see from the press clipping that Network Rail also have stated, to Hackney Gazette, that there has been no agreement made with Rothas Ltd ( the developer). In the absence of any agreement between them it appears that Network Rail would have got nothing back as a result of forgoing its development rights and the developer would have got a substantial windfall benefit by being able to substantially increase the numbers of windows, and so the number of habitable rooms, in the towers. Hackney Gazette reported that the Chair of the Planning Committee said he believed the application should be refused on grounds which included that it compromised future development of the railway station. 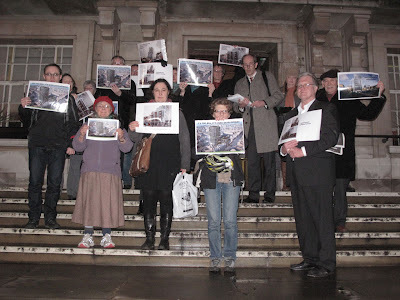 The meeting in Hackney's Council Chamber on Wednesday 7th March was packed with members of the public when its Planning Committee unanimously rejected Rothas Ltd.'s application to build an exclusively private 18-storey towerblock next to Dalston Kingsland station which would have dominated the area and have no affordable housing. Protesters gathered on the Town Hall steps before the meeting holding captioned images describing the key features of the scheme - "IT'S TOO BIG. IT'S OVERDEVELOPMENT"...."IT DISRESPECTS THE LOCAL HISTORIC CHARACTER".... "IT OVERSHADOWS RIDLEY ROAD MARKET"....."NO AFFORDABLE HOUSING"
Five local people spoke at the Committee Meeting on behalf of OPEN Dalston members and the 1328 people who had signed the petition objecting to the scheme. Elsie Pilbeam, artist, condemned the lack of affordable housing and warned that, by taking money to upgrade the station, Hackney would be putting itself into the developer's hands. Catherine Bond, a principal conservation advisor, condemned the damage which the massive scheme would do to the human scale of local historic environment. Ronald Barden, businessman, criticised the overbearing nature of the scheme which would not provide an attractive destination to help Dalston's regeneration but dwarf the area and cast it into shade. Alice Sharp, art curator and mother with children at Colvestome Primary School, condemned the inadequate public consultation. Bill Parry-Davies, OPEN's founder, introduced our speakers and concluded that the Committee should reject the application which was contrary to Hackney's Core Planning Policy. Nevertheless it appeared that the Committee had a good grasp of the objectors' concerns and, after a few searching questions to the developer's men in suits, Councillor Vincent Stopps (Chair of the Committee) moved to a vote. 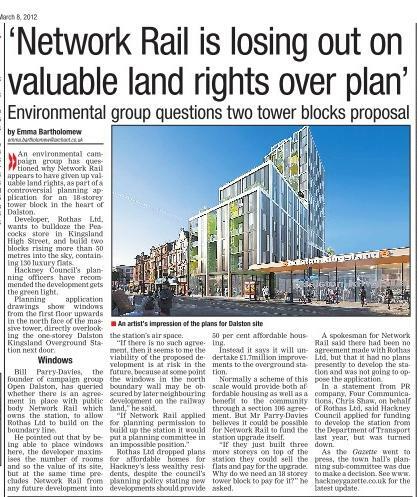 In his view the application should be refused on the grounds that the proposal would not provide affordable housing, because of its bulky design and height, the loss of shop and floor space which it would entail, and because it compromised future development of the railway station. The Committee unanimously rejected the scheme to jubilant cries and applause from Dalston's community present in the meeting. Celebrate Dalston's fight for environmental and social justice. Today we handed in a petition of 1328 signatures of local people objecting to the Dalston Kingsland towerblock application. At the eleventh hour shocking new information has come forward which we will report in our next article.We have prepared what we will say to the Hackney Planning Committee tonight. Tomorrow we will celebrate Dalston's fight for environmental and social justice (see below). We invite all who are part of our campaign to come to JAZZ AT WU's tomorrow , Thursdy 8 March, from 9pm until 11.30pm at 49 Ridley Road, Dalston E8. 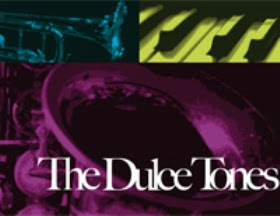 We will be entertained by the Dulce Tones and the extraordinary tales of bluster, subterfuge and greed that have been revealed. We will celebrate Dalston's fight for environmental and social justice. Dalston Kingsland Towerblock. Hackney to decide on Wednesday 7th March at 6.30pm. 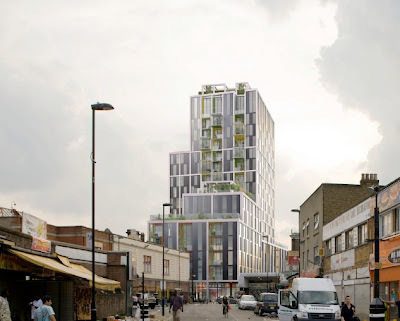 Hackney's Planning Sub-Committee is to meet at 6.30pm on Wednesday 7 March at the Town Hall to decide whether to grant permission for an 18 storey, 50 metre high private towerblock at 51-57 Kingsland High Street which has no affordable housing. (It's the Peacocks site next to Dalston Kingsland station). We intend to object to this gross over development and exploitation of Dalston. Meet us on Wednesday at 6pm on the steps of the Town Hall, Mare Street. It's not too late to make your views known to the Council. Send them in an email to planningconsultation@hackney.gov.uk and put "Planning Application 2011/3439 : 51-57 Kingsland High Street" in the Subject line. On 29th February Boris' Greater London Authority decided that "in general, the application complies with the London Plan although some further discussion and commitments are needed". Its reservations relate to issues of financial viability, child play space, noise, climate change mitigation and transport. If Hackney grant permission on Wednesday then Boris will have 14 days within which to intervene. The GLA has commissioned an independent financial viability report to asses construction costs, developer's estimated profit (so far declared at £10.8million) and the developer's contribution to community benefit (section 106 contribution).